Discover our “flower boxes”, filled with a big bunch of fresh flowers. Just perfect to decorate your home, a reception or a party room. Or simply as an impressive gift, for someone who loves to decorate with flowers. Sometimes, the flowers may arrive unopened, so that the buds will come into bloom within about a day and the recipient will enjoy the flowers even longer. 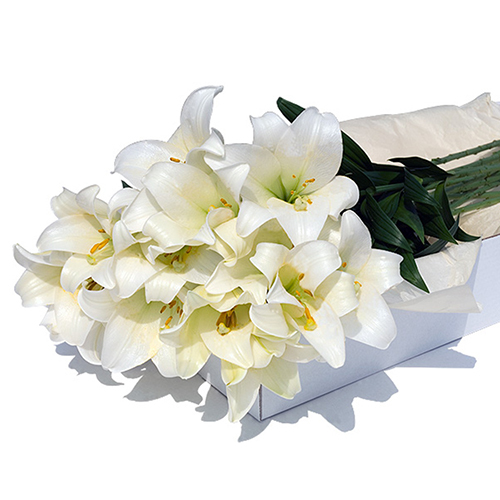 Long stemmed white lilies with a lovely scent, elegant and refined, whether they’re opened or unfurled. This bunch is available in different sizes. Each bouquet is created to order by florists in our own workshop. The flowers are shipped in special designed boxes, the stems in a protective gel.